I went to a trial Japanese lesson right by Lidabashi Station early afternoon. Before heading to class, I grabbed a quick but delicious lunch at Botejyu San. 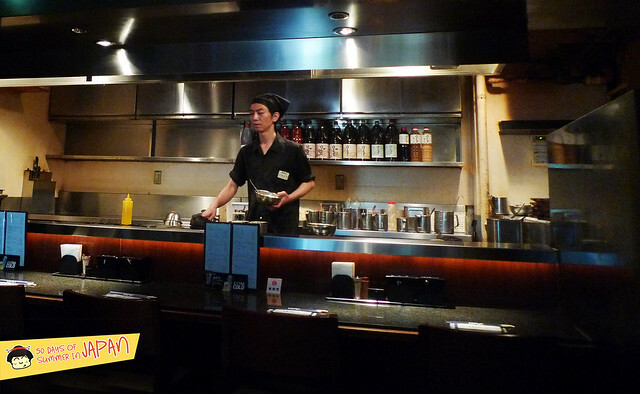 The chain restaurant is planted all over Japan with branches in Singapore, Korea and Taiwan. 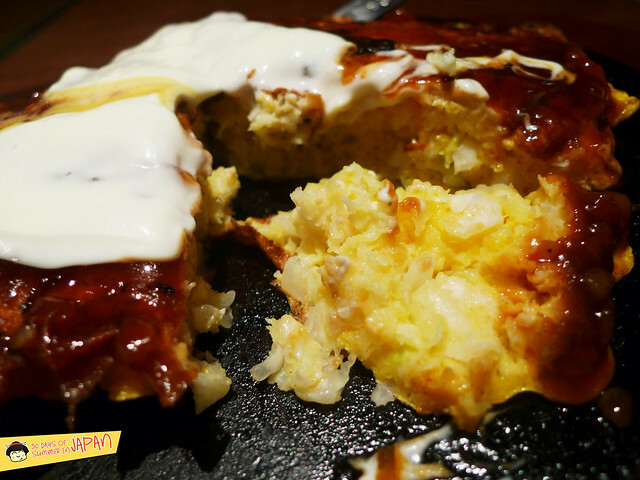 Flipping Japanese style savory pancakes aka okonomiyaki since the 40’s. Yup, they know their stuff. After my lesson, I went “Shoppingu” (see? I learned something). And had a delightful Matcha Coffee Jelly Affogato as my late afternoon pick-me-up. The Libadashi location of Botejyu San has a very sleek interior. Spacious, modern yet warm, specially the faux digital fireplace throughout. 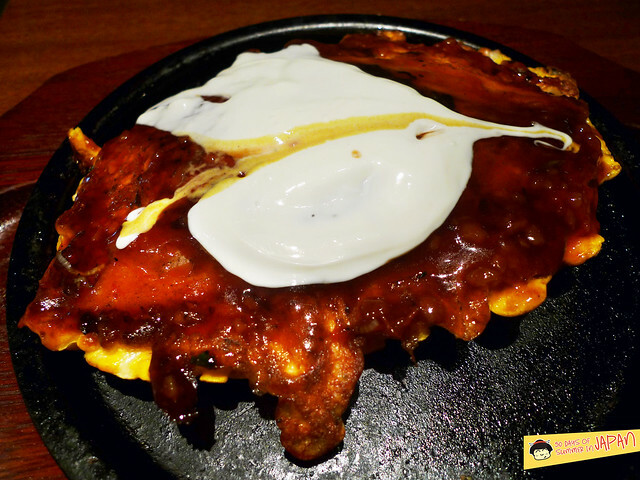 My okonomiyaki was made to order. I watched as the chef poured the batter onto the long flat grill. And waited patiently for 15 minutes. My wait was rewarded with a superbly crispy exterior (essential part of any memorable okonomiyaki experience). 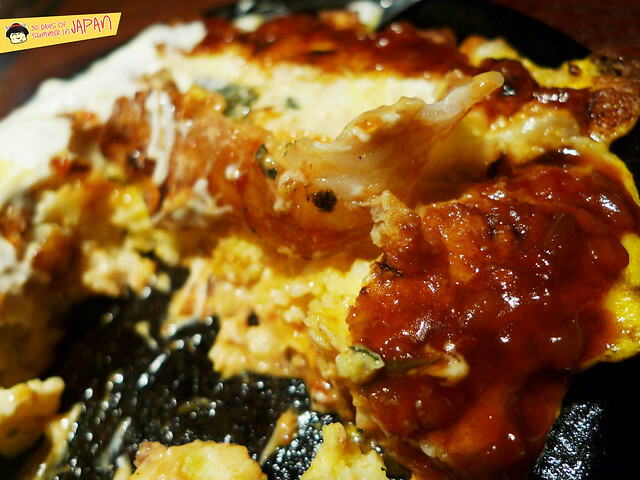 That crispy crust was carried all around the edges with layers of egg peeking throughout the sides, on a sizzling plate. 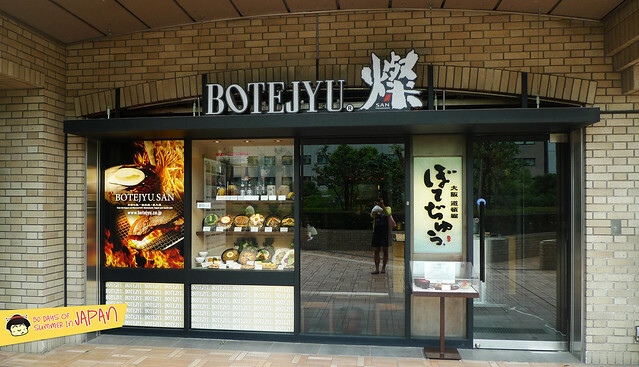 The mayo topping seems rather common these days, but Botejyu claims to have started that trend back in the 40’s, when mayo was still relatively new to Japan. Not only that, but they now bottle their own brand. Served throughout their restaurants. The center is a total contrast of warm fluffy goodness. Their batter is a combination of domestic flour mixed with a broth of squid, shrimp, bonito, kelp and powdered skim milk. Along with that batter, there’s a large handful of cabbage, eggs and thin slices of pork belly. There’s a couple different “topping” choices on the menu. I went with a my all time favorite combo, a classic in my book. The result is an unruly yet totally tasty mess. A good balance of sweet and savory. The contrast of crispy/crunchy and soft/gooey. Their mayo is light but flavorful with a hint of acidity. The brown sauce has plum flavors and tartness, but mainly on the sweet side. Savory pork pieces are evenly distributed and add that fragrant fat into the mix (think bacon). The batter is well seasoned with eggs all over the place. The complaints I’ve had from the versions around NYC were either not enough “crust” and too doughy or runny in the center or vice versa, dry and chewy. Many places serve an almost flavorless batter, heavily relying on the mayo and sweet brown sauce to carry it through. Botejyu’s version solved all of the above (decades perfecting the recipe). One of the best okonomiyakis I’ve had yet. My one and only wish, was to have more pork belly. If that was multiplied, this hot Japanese spheroid would of been perfect. Class didn’t go as well as I hoped, some classmates were way more advanced, which didn’t help my confidence or eagerness to speak the few words I knew. Maybe with age, it’s just harder to learn?! To brighten my day, I went shopping and rewarded my challenged language skills with an affogato a la Nippon style. 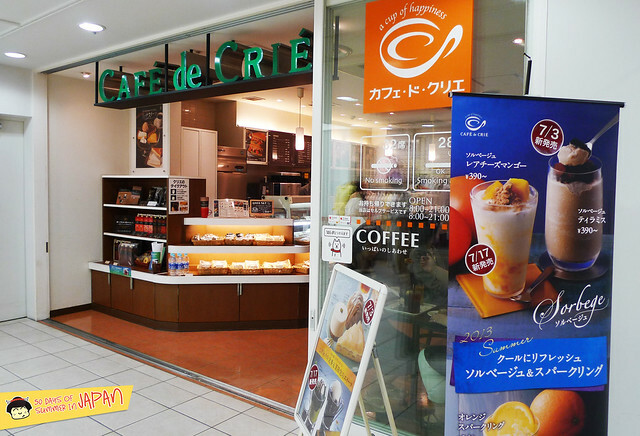 Cafe de Crie has several locations in Tokyo. Within the Central Plaza Ramla lidabashi, where I was shopping, in between the 2 sides of the mall. Perfect after my “exercise” of choice. 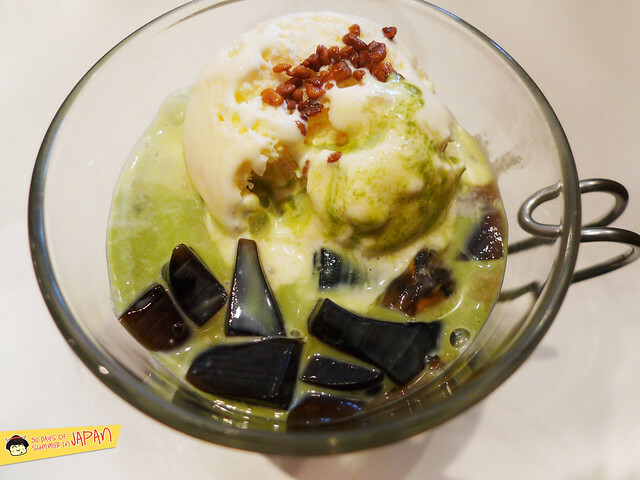 A shot of matcha, cubes of coffee jelly and a scoop of vanilla ice cream topped with crunchy caramel bits. 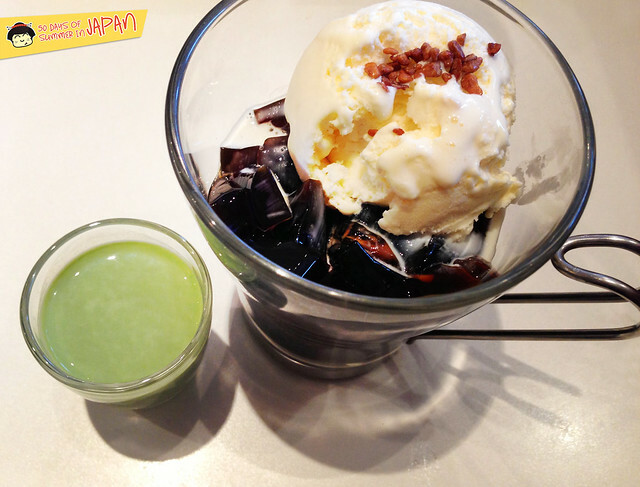 Grassy and bitter sweet matcha is poured into a pool of creamy vanilla ice cream and cold java jelly. Talk about an sweet dose of caffeine! Love, love, love. Hey Cindy, long time! It’s been what, a few years? 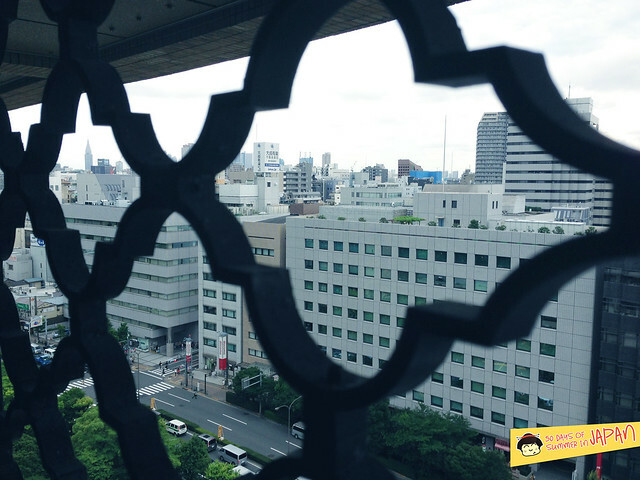 Really enjoying this Tokyo diary, as I’ve still never been. What boards and blogs are you using to get information for where to eat? Hey thanks!!! Last I saw you was the whole piggy feast! Yea that was quite some time ago!